In the world of moisture analyzers, the moisture balances of CSC Scientific have found a special place. Starting with the CENCO Moisture Balance, the first ever direct reading moisture balance, these moisture instruments earned a reputation for being precise, accurate and tough. They are being used in dusty, cold, humid and just overall nasty places to reliably measure moisture content. The CSC Digital Moisture Balance has been further ruggedized with the incorporation of an almost indestructible precision balance as its main engine. The instrument can be used for the full range of Loss-on Drying moisture measurements. 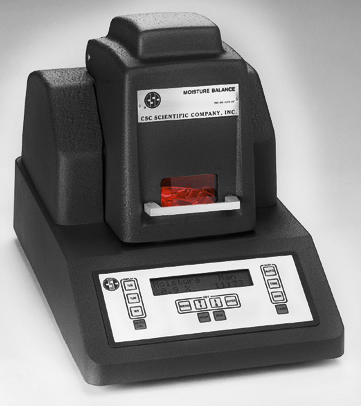 Because of the large array of products that can be can be tested and its accuracy of +/- 0.2% with a five gram sample (larger samples will result in increased accuracy), the CSC Digital Moisture Balance is an outstanding selection for any testing lab. In addition to the benefits of having one accurate, rugged moisture measurement instrument, the CSC Digital Moisture Balance was developed for easy use. The operators have only three easy steps. They insert an empty sample pan and press a tare button, load a sample, then press the start button. The rest of the moisture test, including shutdown and moisture test analysis recording, is automatic. Three operational modes - 1.) Manual. 2.) Time. 3.) Automatic. Results to +/- 0.2 % moisture with a 5 gram sample. Output port for computer connection. We hope that this material illustrates the adaptability of the CSC Digital Moisture Balance to the solution of your moisture measurement. If you have additional questions, email us at moisture@cscscientific.com, call 703-876-4030 or chat with us online.